Capital 101.7 makes this material available on the understanding that users exercise their own skill and care with respect to its use. Before relying on the material in any important matter users should carefully evaluate the accuracy, completeness and relevance of the information for their purposes and should obtain appropriate professional advice relevant to their particular circumstances. The material at this site may include views or recommendations of third parties, which do not necessarily reflect the views of Capital 101.7 or indicate its commitment to a particular course of action. By accessing information at or through this site each user waives and releases Capital 101.7 and its servants to the full extent permitted by law from any and all claims relating to the usage of the material made available through the website. In no event shall Capital 101.7 be liable for any incident or consequential damages resulting from use of the material. Capital 101.7 is committed to quality service to its customers and makes every attempt to ensure accuracy, currency and reliability of the data contained in these documents. However, changes in circumstances after time of publication may impact the quality of this information. Confirmation of the information may be sought from originating bodies, departments, colleges or schools providing the information. 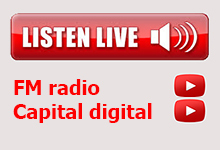 Capital 101.7 is not responsible for the contents or reliability of the linked websites and does not necessarily endorse the views expressed within them. Listing shall not be taken as endorsement of any kind. We cannot guarantee that these links will work all of the time and we have no control over availability of the linked pages. Links to other web sites are inserted for convenience and do not constitute endorsement of material at those sites or any associated organisation product or service. These external information sources are outside our control. It is the responsibility of users to make their own decisions about the accuracy, currency reliability and correctness of the information at those sites.